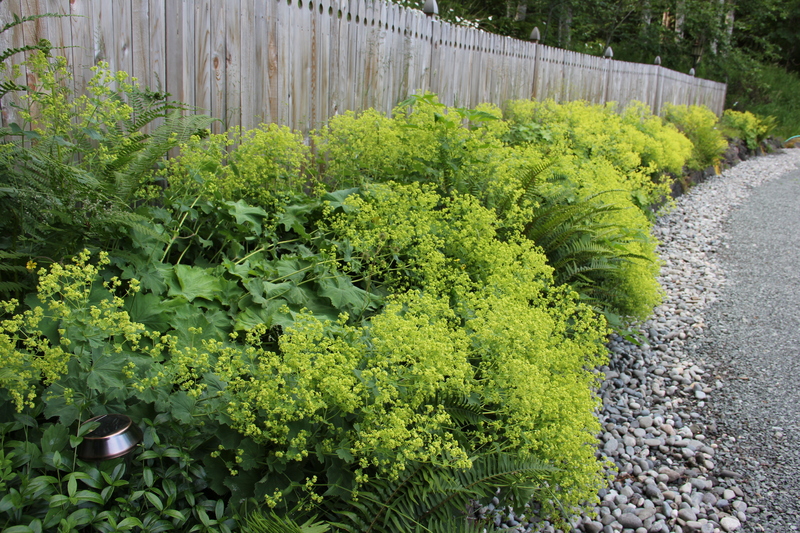 This is the height of the Alchemilla mollis, or lady’s mantle, season at Coppertop with dozens in bloom. These perennials’ pale yellow blossoms are most prevalent above the driveway’s rock wall, but are also scattered throughout the perennial beds and grouped on the hill with the lupine. The delicate yellow flowers add a softness to bouquets. My favorite characteristic of alchemilla is the plant’s velvety leaves. Its silvery-green foliage resembles a folded fan or accordion; it traps raindrops and dewdrops in a lovely manner. 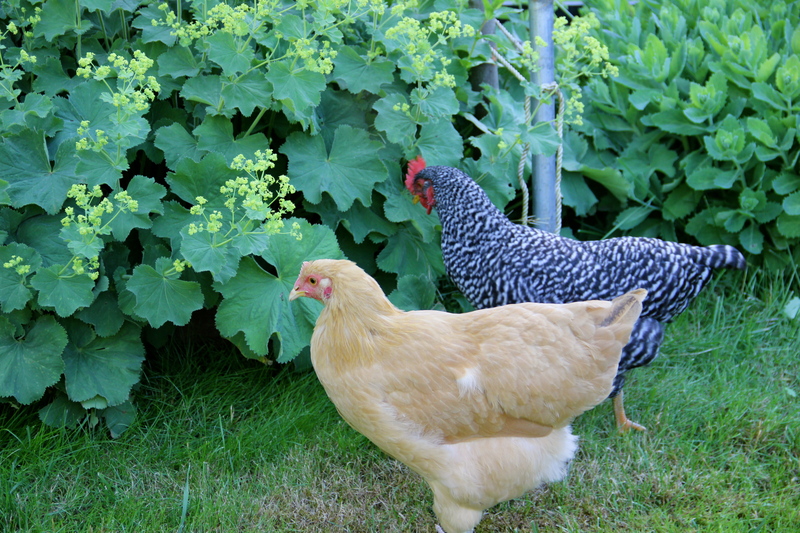 Here are some chickens admiring the leaves! 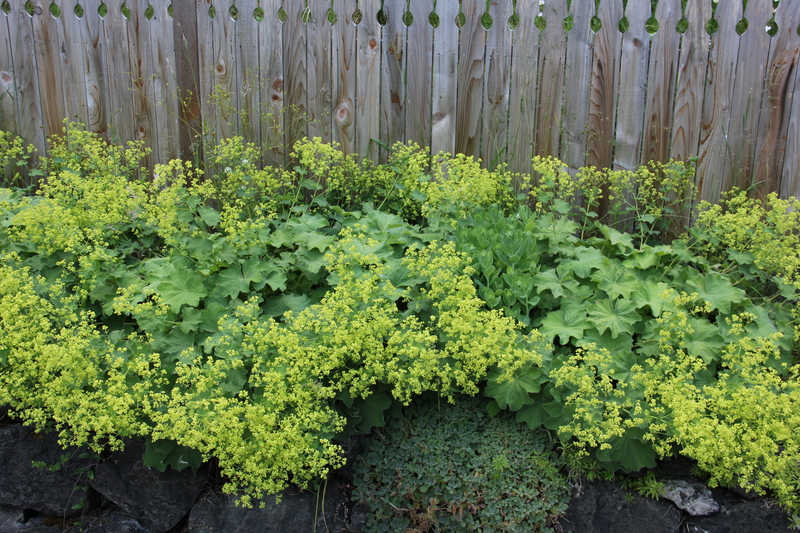 The plant’s common name, lady’s mantle, was given due to the pleated leaves that look like a lady’s cloak from medieval times. I’ve read that the original common name of the herb was Our-Lady’s-mantle in honor of the Virgin Mary. This is my very first time growing alchemilla, and I’m thankful that it’s extremely low maintenance, pest free, and long lasting. It’s especially pretty spilling from the little round bed by the front door. 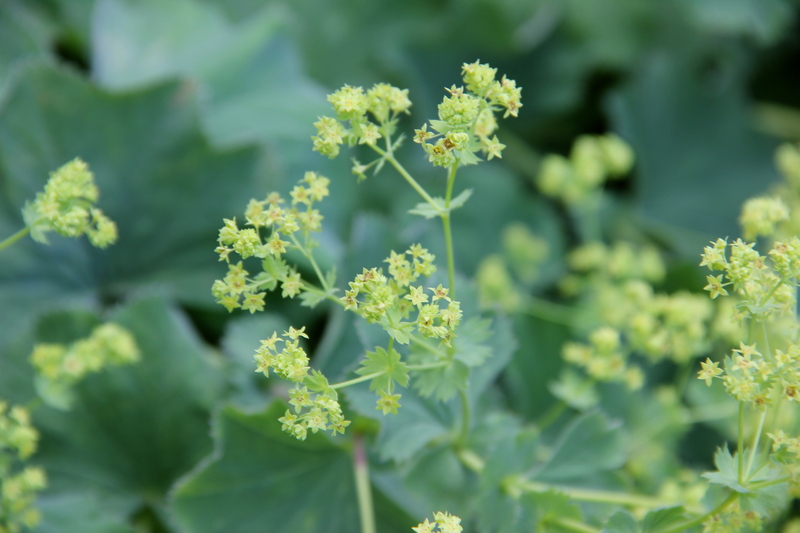 Lady’s mantle has been used for centuries in Europe. Some herbalist experts consider the plant to be good for treating wounds due to its blood clotting and astringent properties. It has also been used as a mouth rinse after dental procedures to help stop bleeding. Additionally, lady’s mantle has been used for menstrual disorders, as an aid during conception, in the prevention of miscarriages, and to help the body heal after childbirth. Current clinical data seems to be lacking, but to read more about the herbal, possibly healing properties of this plant, this site may prove to be helpful: http://www.cloverleaffarmherbs.com/ladys-mantle/. 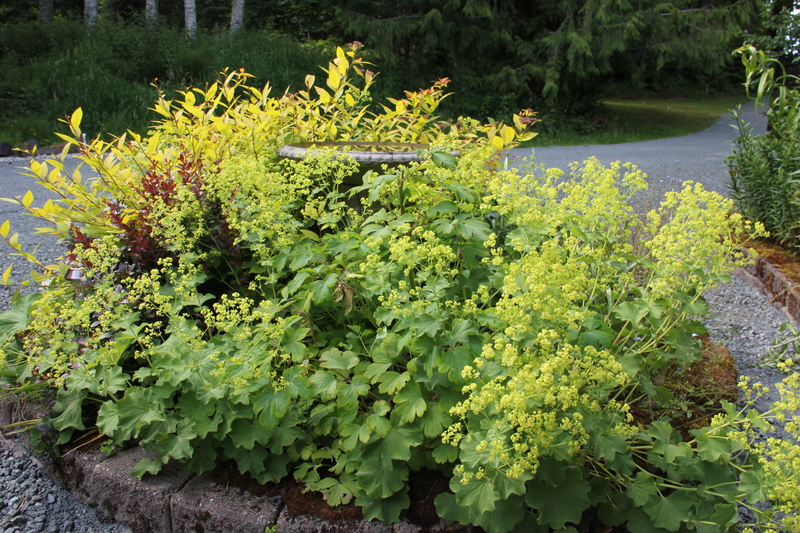 This entry was tagged alchemilla, gardening, lady's mantle, Olympic Peninsula, Pacific Northwest. Bookmark the permalink.